Also, once the price has reached the PRZ other techniques - particularily those characterizing a reversal (volatility compression, oscillators, small candlesticks) - are employed before any order is sent. Basically because sometimes the price might just pass straight through a pattern. In fact many harmonic traders swear by a confirmation ritual where the price must touch and react at each harmonic level in succession before executing a trade. But I think traditional reversal signs can be enough to trade on when they occur at the harmonically determined price. Hi guys! 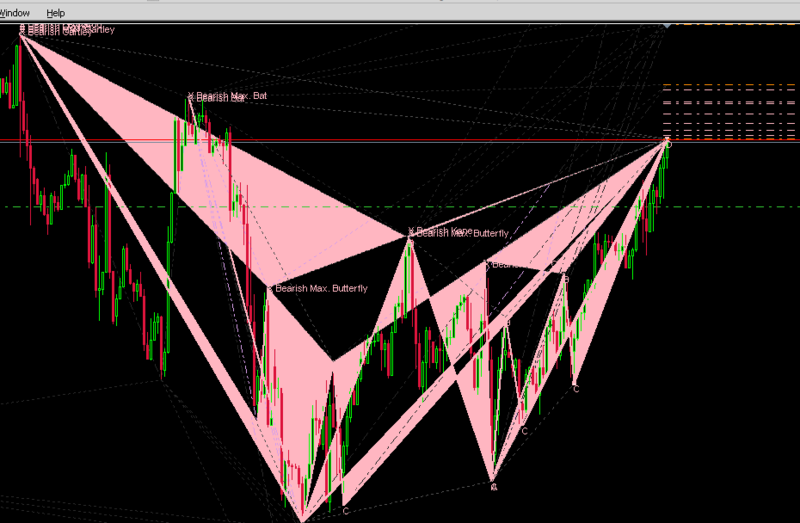 Whats the installation process for this on MT5? I tried dragging the files to the indicator folder but it doesnt show up on MT5 when I restart the program. Pls help! *UPDATE* All good found the answer in the thread. If you download the zip file, there's one file missing "HarmonicPatternFinderV3.ex5". You need this file to compile in the meta editor. What I did was to download this file separately from the file list provided by the author. Can anyone pls help me understand whats going on here? There are multiple patterns shown here. I have disabled past patterns for declutter but I can't seem to understand whats the issue here? appreciate your help! p.s I have no idea which pattern to focus on. It's what happens when filled patterns overlap sadly. Best to just turn off that feature ("Fill patterns"). The underlying issue seems to be the MT platform trying to superimpose filled areas by mixing the colors in a manner that gives rather strange results. Specifically, if two filled areas of the same color overlap, the color in the overlapping part is zeroed out such that it becomes as if having no fill there at all. If a third area overlaps the zeroed out part again the color will reappear, and so on. Could you explain how to make an EA please? I can explain how to add harmonic pattern finding as an extension to an EA or other custom code project. This is because the code is simple to integrate, just as a library. First, include and instantiate the CHPFMatcher, and write a custom implementation of CHPFMatchProcessor - a callback object that is called on harmonic pattern matches. The CHPFMatcher must be given the slack values it should use and a reference to the concrete CHPFMatchProcessor. The EA would also need to include a ZigZag indicator. What will happen is that the CHPFMatcher finds patterns matching the description inside the timeinterval. For each pattern found control is passed to the appropriate method in the callback object. If the callback object buffers the matches into a list, it is possible to go over these after FindPattern() has returned and see if any matches are at the current price/time. Thank you Andre for this tool....Killing V75 index trades with it...Can't thank you enough...super tool.